Man vs. Machine match ends in 2-2 deadlock! The highly-anticipated "Man vs. Machine" ended today in a 2-2 draw. An exhausted Garry Kasparov, the world's #1-rated player, breathed a sigh of relief after proving that the silicon vs. carbon debate is not yet settled. After demolishing X3D in Game #3, he stated, "Machines still have much to learn from us." Kasparov took home a total of $175,000… $150,000 appearance and $25,000 for drawing the match. What is certain is that computer programs are getting better and better, and of course, hardware is getting more and more powerful. Are the days of humanity's claim to chess supremacy numbered? Kasparov believes that while computers are improving, so are humans and their knowledge of how to approach "scientific chess." 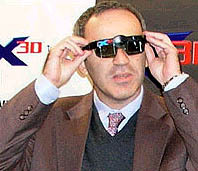 GM Garry Kasparov with the specially-designed 3D glasses. The breakthroughs in this match were monumental… the 3D technology, the voice-recognition software and the 2807-rated computer caused worldwide intrigue. Chess websites (including The Chess Drum) broke all kinds of records for traffic. Indeed it is a good day for chess when it receives prime coverage by ESPN, the largest sports station in the world!